Medium - $53.99 Large - $53.99 Only 5 left! All kids seem to love their extracurricular activities--basketball, swimming, chess, soccer, theater, even Math!--you name it, and your kid’s school probably has a club for it. Oh, the Vigilante Club? Hmmm...No, we don’t know where that meets. We are actually not sure the PTA has approved that club’s mission to “take on secret identities to rid the city of criminal activities.” LAME. We totally support your little guy starting it! 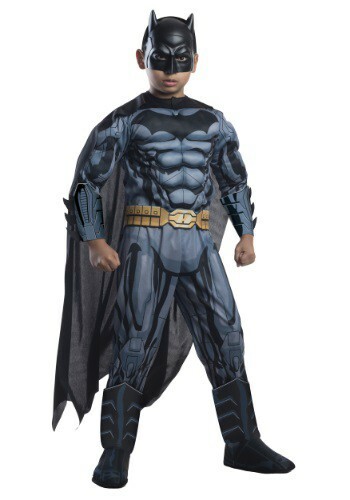 We know right now he may be only working part time, but we think that this DC Comics Deluxe Child Batman Costume will help get his superhero career started off on the right boot-topped foot! After all, Gotham City is a long way from your town, Batman himself can’t possibly be expected to cover than much territory! Since your hometown is kinda sleepy, your tiny fella can keep busy by confronting th school bullies and ensuring that the picked-on kids have someone to stand up for them. Aw. How can there not be a club for that? This jumpsuit has sculpted muscles that will make him extra intimidating, while the Batmask will hide his identity...at least until he starts campaigning for his club! Just make sure your child is comfortable using a Batarang before you suit him up, since every joker in a the school will want to see him use it at the first club meeting!